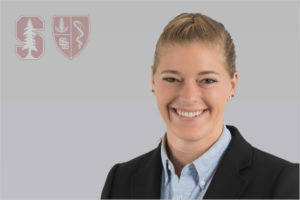 Lexie has been with Stanford Sports Medicine since 2015, serving as the Research Coordinator for two Pac-12 Conference research initiatives, the Pac-12 SIRMAP (Sports Injury Registry Management and Analytics Program) and the Pac-12 Brain Trauma Task Force Equipment Program. As a sports med Research Associate, she assists with several different research projects both at Stanford and around the country. Her research interests include utilizing de-identified sports injury data to facilitate trend analysis and identify opportunities for novel treatment interventions and supporting the development of emerging technologies to aid objective concussion diagnoses. Lexie received her B.A. from Stanford in Human Biology, with a concentration in Health and Human Performance. As the team captain of Stanford’s Varsity Women’s Water Polo Team, she won 3 NCAA Division I Championships during her time on the farm. Outside of Stanford Sports Med, Lexie is an active volunteer, working as an EMT with HealthRIGHT 360’s program Rock Medicine and assisting on stewardship projects with the California State Park Foundation. Lexie also serves on the Board of Directors for Chhahari Inc., an organization operating an orphanage in Kathmandu, Nepal, and has travelled to Nepal multiple times to assist at the home, teach at a local school, and volunteer for a Nepali healthcare NGO.